First and Last Frost Dates for the UK / France / Spain /Slovakia etc. Thread: First and Last Frost Dates for the UK / France / Spain /Slovakia etc. Bucks, allotment, heavy clay, hardiness zone 8a. Last frost 1st-10th Apr. First Frost 1st-10th Nov.
Other countries are also listed if you have a look around. I have struggled with other sites as the 'nearby towns' thing was't accurate enough - they weren't that nearby and had different dates I guess due to the geography of my region. Nicos, veggiechicken, sparrow100 and 2 others like this. Useful for planning ... but in practice huge variability year-to-year on actual dates. For folk starting things off on modules / under cover the date is not too critical, as the plants will "hold" for a week or two if, come planting out time, the forecast is dire (indeed, if its a cold spring then the plants in modules are probably "behind" compared to an early mild Spring, so will hold longer. I pot-on from 1" cell modules to 9cm pots, and they give me a good holding time for plants if I am not ready to plant out. 9cm pots take up a lot more staging space than 1" modules though!! but by that time they are outside for hardening off, all of them are in carry-trays, so can (with some hassle) come into the greenhouse or conservatory for the night if there is a late frost. Its another benefit of growing in modules, to plant out, which I might add to my justification for why the extra Faff!! is worthwhile. Yes, they are average dates so perhaps err on the side of caution! Where are those courgette seeds? Thelma Sanders, sparrow100, Jay-ell and 1 others like this. My last frost dates are probably 5 weeks out as we are in a frost pocket...but it's good to finally see a map for France! 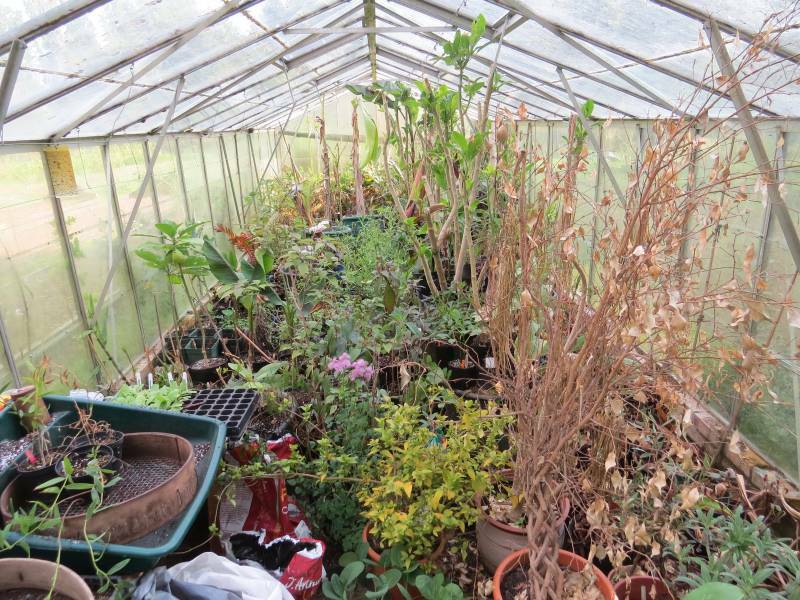 late frost last May ... had to cram everything in the greenhouse for the night !!! veggiechicken, Scarlet, carly and 4 others like this.